The sub-title does not lie: this book is indeed chock full of tales of mischief. 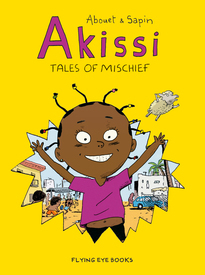 In fact, there are 21 full color 6 page comics featuring Akissi & Co. getting into all sorts of trouble, both in their home stomping grounds in the Yopougon neighborhood of Abidjan in Côte d'Ivoire (Ivory Coast) and out in the country at Akissi's nan and granpap's rural digs, where the natural world plays a larger part in the shenanigans. These are kids comics par excellence; think Dennis the Menace without the hyperbole. In Akissi, the world of childhood comes alive on the page: the zany antics, the interactions of children with their parents and peers, the leaps of both faith and logic. The childhood experiences represented here – while full of wonderful details specific to time and place – is universal in its core essence. *While this book is indeed "kid friendly" and the general tone and mode are entirely appropriate for children, the specifics of the childhood on display, which occasionally involve bodily parasites, children putting themselves in potentially dangerous situations, and at times seemingly lax parental oversight may strike some parents as worrisome. But, thinking back to the adventures of Dennis the Menace and, say, Huey, Dewey and Louie Duck, when kids roamed wild and occasionally entirely free of parental supervision, will remind readers that while the specifics of childhood vary both over time and from place to place, kids will be kids!